When Tosha the cat went missing in Crawley, West Sussex in 2007, his owners feared the worst. Natasha and David Lewington had left their beloved moggy in the care of a family friend in Maidenbower while they were working overseas, but when they returned home he was nowhere to be seen. However, 10 years later, the couple were shocked to receive a phone call from Cats Protection’s National Cat Adoption Centre in Sussex, saying that Tosha had been found. The relieved owners soon discovered that the cat had been taken in by an elderly lady living in nearby Tilgate shortly after he went walkabout. 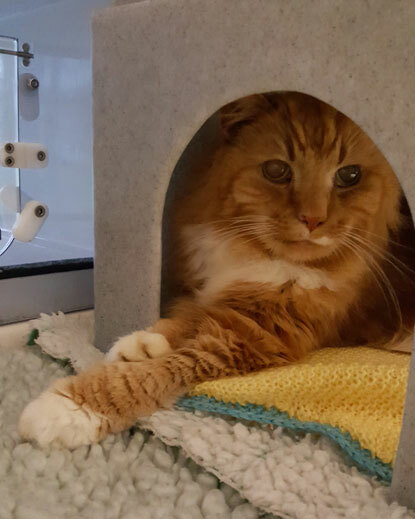 She had given him the name Ginger and cared for him until she sadly passed away in January 2018, at which point he was brought into the adoption centre to be rehomed. When Cats Protection staff routinely scanned him for a microchip, they discovered the details of his original name and owners and made the call to let them know he has been found. David added: “It was great to see him again – of course he is a lot older, a bit slower and is still getting to know us again. But we can see he’s the same old Tosha and it’s really wonderful to have him home again. We're just so pleased we had him microchipped, otherwise we'd never have had this happy ending." Deputy Manager of Cats Protection’s National Cat Adoption Centre Karen Thompson explained: “All cats that come into the centre are routinely scanned for a microchip and it’s not unusual to be able to trace owners for cats which have been missing a few months. “However, it’s rare we find a cat that has been missing for such a long period of time. It seems that Tosha had become lost and started straying but was fortunate to have been taken in to a loving home. 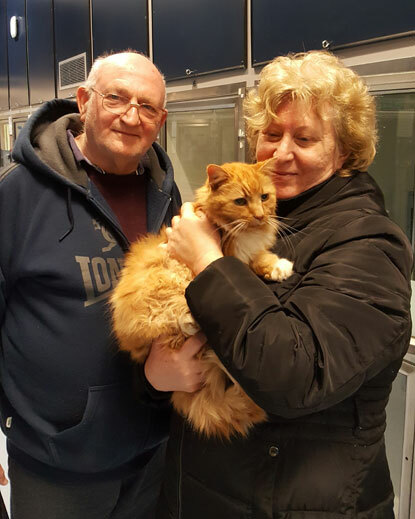 He has clearly spent the past decade being a much-loved pet, and while the circumstances of him coming into the centre are very sad, it’s comforting to know he can now be returned to his original owners. For information and advice on how and why you should get your cat microchipped, visit the Cats Protection website. Also demonstrates the importance of keeping your microchip registration details up to date. If Tosha's original owners had moved home or changed their phone number during those ten years (which is quite likely) and not updated their registration, they would have been untraceable. This also shows the importance of microchipping even if you think your cat may be dead. If you keep the contact information up to date you might just get a lovely suprise one day. Makes you wonder why in 10 years no vet had scanned him - perhaps the old lady had not mentioned he was a stray, or taken him to the vet!